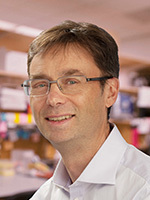 My lab’s interests are in the early development of epidermal and neuronal tissues, and in the responses of epidermal and neuronal cells to damage. We are studying these processes in the nematode worm Caenorhabditis elegans. C. elegans is an excellent organism for analyzing fundamental aspects of development. Worm genetics is simple and cheap; gene function can also be probed using genome wide RNA interference screens. Embryogenesis takes 12 hours and its dynamics can be studied using timelapse microscopy and fluorescent markers. We are interested in epidermal (skin) development as a model for epithelial morphogenesis. The worm epidermis is a simple epithelium that encases the animal. In embryogenesis the epidermis spreads out over substrate cells to enclose the embryo (enclosure) and subsequently undergoes elongation (Chisholm and Hardin 2005). Pathways involved in these processes are evolutionarily conserved, and several are implicated in cancer or other genetic diseases. We showed that signaling via the C. elegans Eph receptor tyrosine kinase and its ephrin ligands are required for enclosure (Chin-Sang et al., 1999). Ephrin signaling acts to promote earlier movements of neuroblasts that form a substrate for epidermal enclosure. We are currently using genetics, laser microsurgery and quantitative timelapse microscopy to define the cellular and molecular basis of these neuroblast migrations. 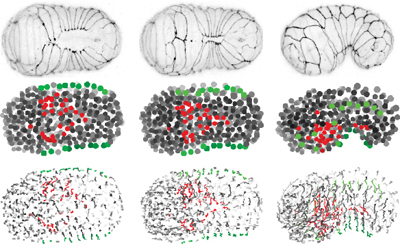 Using advanced imaging and new image analysis algorithms we have been able to track the migrations of all nuclei in the embryo during epidermal morphogenesis. We plan to use mathematical modeling to understand how forces are generated in the substrate and in the epidermis to promote spreading. In large-scale genetic screens for epidermal morphogenesis mutants we identified numerous genes affecting epidermal cell-matrix attachments and the extracellular matrix, in many cases providing the first genetic models for a conserved gene family. Among these we identified peroxidasin, a poorly understood enzyme affecting the extracellular matrix (Gotenstein et al., 2010), as essential for elongation and later tissue adhesion. We are currently focusing on peroxidasin and its interactors, with the goal of identifying substrates of peroxidasin activity. The epidermis forms the first line of defense against injury and microbial pathogens. In collaboration with Jonathan Ewbank (Marseille) we have developed C. elegans as a model for epidermal wound responses and repair pathways (Pujol et al., 2008). We have identified mutants in which the epidermal damage response is constitutively activated (Tong et al., 2009). We are focusing on the role of calcium signals in damage sensing and how injury signals are interpreted by the epidermis. The ability of axons to regrow after injury has been known for decades, yet axon regrowth mechanisms remain poorly understood owing in part to the lack of genetically tractable models. In collaboration with Yishi Jin’s lab (UCSD) we have developed C. elegans as a genetically accessible model for axon regeneration (Wu et al., 2007). C. elegans neurons display robust regenerative responses that critically depend on the DLK-1 MAP kinase pathway and second messenger cascades (Ghosh-Roy et al., 2010). We are performing large-scale screens to identify new regeneration genes; results from a pilot screen of 650 genes have identified a large number of new genes whose role in axon regrowth was not previously suspected (Chen et al., 2011). We are continuing to expand this screen and to dissect the roles of these novel regeneration factors. Dejima, K., Kang, S.-R., Mitani, S., Cosman, P., and Chisholm, A.D. 2014. Syndecan defines precise spindle orientation by modulating Wnt signaling in C. elegans. Development 141: 4354-65. Chisholm, A.D., and Hardin, J.D. 2005. Chapter on “Epidermal Morphogenesis” for Wormbook. Pujol, N., Cypowyj, S., Ziegler, K., Millet, K., Astrain, A., Goncharov, A., Jin, Y., Chisholm, A.D., and Ewbank, J.J. 2008. Distinct innate immune responses to infection and wounding in the C. elegans epidermis. Curr. Biol. 18: 481-489. Tong, A., Lynn, G., Ngo, V., Wong, D., Moseley, S.L., Ewbank., J.J., Goncharov, A., Wu, Y., Pujol, N., and Chisholm, A.D. 2009. Negative regulation of C. elegans epidermal damage responses by Death Associated Protein Kinase. Proc. Natl. Acad. Sci. U.S.A 106: 1457-61. Xu, S., and Chisholm, A.D. 2011. A Gαq – Ca2+ signaling pathway promotes actin-mediated epidermal wound closure in C. elegans. Curr. Biol. 21: 1960-7. Xu, S., and Chisholm, A.D. 2014. Skin wounding triggers a mitochondrial ROS burst that promotes wound repair. Dev. Cell 31: 48-60. Chuang, M., Hsiao, T.I., Tong, A., Xu, S., Chisholm, A.D. 2016. DAPK interacts with Patronin and the microtubule cytoskeleton in C. elegans epidermal development and wound repair. eLife, Sep 23;5. pii: e15833. Chisholm, A.D. 2015. Epidermal wound healing in the nematode C. elegans. Advances in Wound Care 4: 264-71. Wu, Z., Ghosh-Roy, A., Yanik, M.F., Zhang, J.Z., Jin, Y., and Chisholm, A.D. 2007. C. elegans neuronal regeneration is influenced by life stage, synaptic branching, and ephrin signaling. Proc. Natl. Acad. Sci. U.S.A. 104: 15132-15137. Chen, L., Wang, Z., Ghosh-Roy, A., Hubert, T., Yan, D., O’Rourke, S., Bowerman, B., Wu, Z., Jin, Y., Chisholm, A.D. 2011. Axon regeneration pathways identified by systematic genetic screening in C. elegans. Neuron 71: 1043-1057. Chen, L., Chuang, M., Koorman, T., Boxem, M., Jin, Y., and Chisholm, A.D. 2015. Axon injury triggers EFA-6 mediated destabilization of axonal microtubules via TACC and doublecortin like kinase. eLife, Epub 9/4/15. eLife.08695. Chisholm, A.D., Hutter, H., Jin, Y., and Wadsworth, W.G. 2016. The genetics of axon guidance and axon regeneration in Caenorhabditis elegans. Genetics (WormBook). Giurumescu, C.A, Kang, S., Planchon, T.A., Betzig, E., Bloomekatz, J., Yelon, D., Cosman, P., and Chisholm, A.D. 2012. Quantitative semi-automated analysis of morphogenesis with single cell resolution in complex embryos. Development 139: 4271-9. For a complete list search Pubmed for Chisholm AD[Author], or search Google Scholar for Andrew Chisholm.